Metroid Fusion is the fourth game in the Metroid series, released for the GBA in 2002. 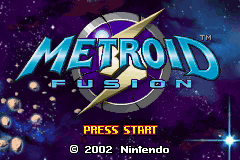 All information relates to the specific ROM: “Metroid Fusion (U) [! ].gba”, it has CRC 6C75479C, sha1 CA33F4348C2C05DD330D37B97E2C5A69531DFE87 and internal name “METROID4USA”. ROM size is 8,388,608 bytes. MAGE - Guide to editing with MAGE, written by OneOf99 read all about its functions here. Double Helix - The now deprecated editor for Metroid Zero Mission, read all about its functions here. These guides cover all the basic things around editing Metroid Fusion, as well as serving as a good starting point for learning how to get into Metroid Fusion hacking! FAQ - Some answers to frequently asked questions in gbatroid hacking. If this doesn't help, remember to read the MAGE docs. These guides assume you have a good basic knowledge about editing Metroid Fusion already, you should probably be comfortable with using Double Helix by now and be moving onto using tools like a hex editor. This segment is reserved for technical information on Metroid Fusion, to be used as reference material for hackers, or for the curious wanting to know what makes Samus tick, or possibly you are interested in making a fan game and want to know how Metroid Fusion does things! Structures of objects in fusion.